The Six Drawer Dresser is a charming and functional bureau for your bedroom. 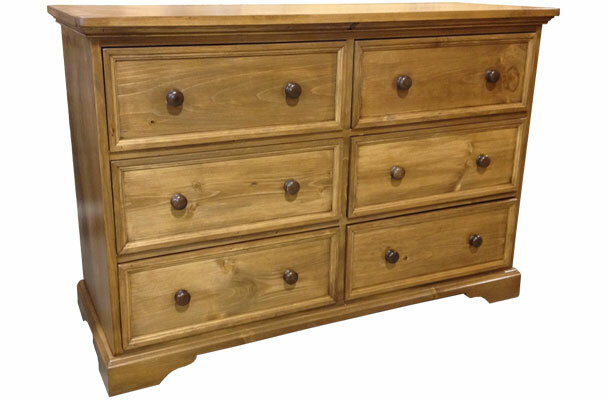 This low and wide dresser features 6 deep drawers, has flat side panels and a decorative scrolled foot. 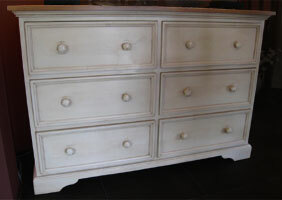 All drawers are framed in raised molding with wood knobs and the drawers slide smoothly on wood runners for ease of use. The Bella Six Drawer Dresser is a charming and functional bureau for your bedroom. The classic country French design gives it a timeless style for generations to adore. The wide dresser offers 6 equal-sized, deep drawers for a balanced design. 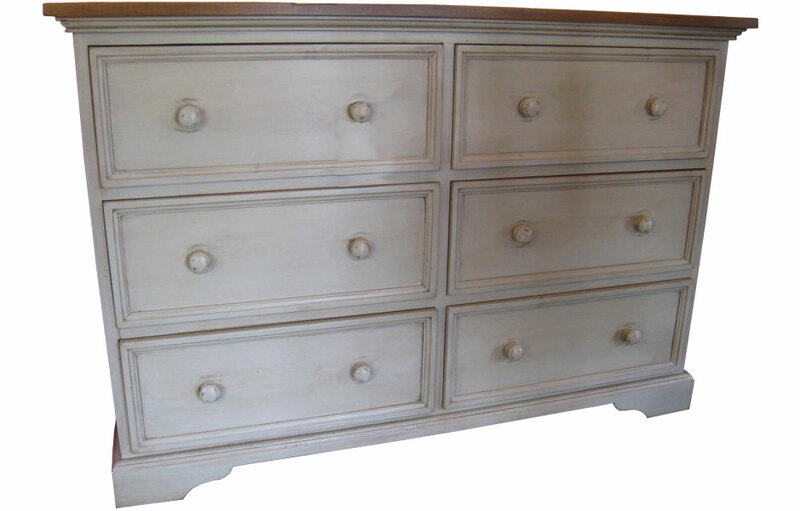 The low wide dresser has traditional details including; bevel panel drawers, scrolled base molding, and flat side panels. 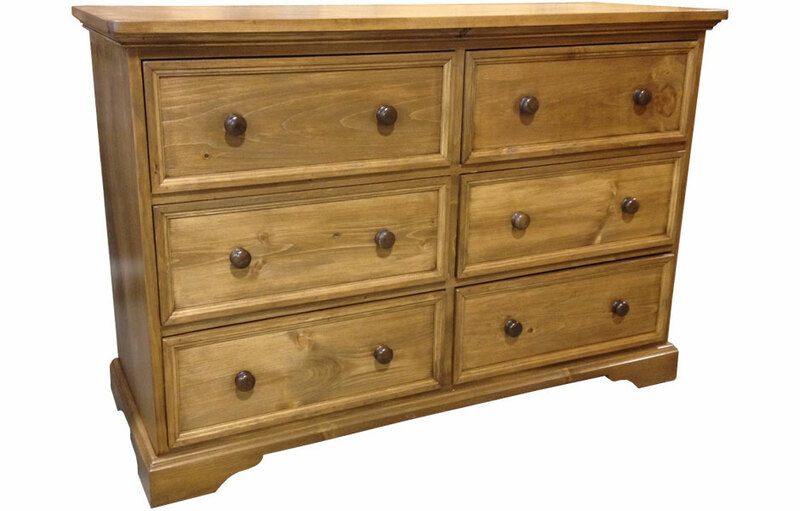 The chest of drawers is accented by the classic wood knobs. The Bella Dresser is made of solid wood. The drawers slide effortlessly on traditional wood glides for ease of use. The entire drawer, including the bottom, is made of solid wood adding to its strength and durability. The thick wood top is water-sealed to prevent water rings—and intended for daily use. The bureau is perfect for adults and kids alike due to it's low-wide design. It's the right height to hang a mirror above it, or display your collections on the top. The deep drawers will provide lots of room of folded shirts, bulky sweaters, pants and sleepwear. The traditional dresser can be painted in a classic two-tone finish with a stained interior and top with painted exterior, or all-over one color finish. The Bella 6-Drawer Dresser complements French Country, English Cottage, Farmhouse, Rustic, Transitional and Traditional style decors. 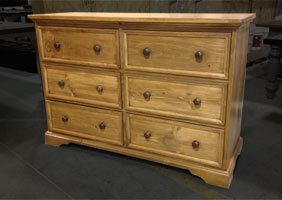 Six Drawer Dresser finished in Natural. Six Drawer Dresser finished in Champlain.